← What colour green am I? It’s been a while coming—due to hectic ‘end of contract’ madness and trying to finish up at work, combined with family members jumping off moving bikes and fracturing elbows (! 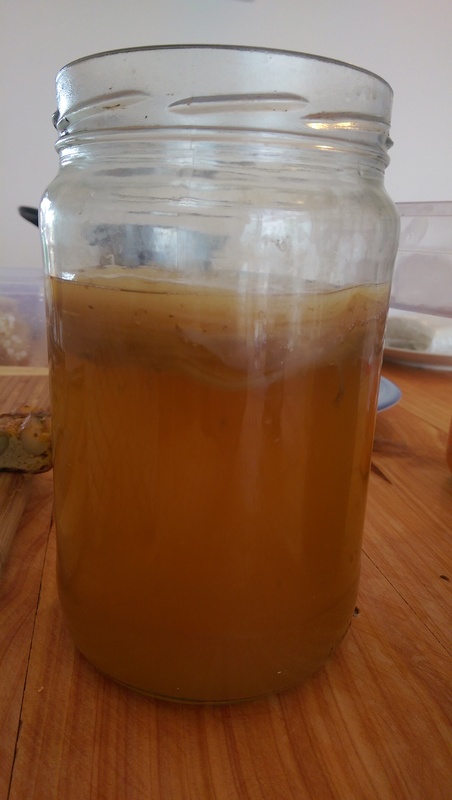 )— but I’m slowly getting back on track with our sustainability adventures so here is the second part of our fermentation workshop. The workshop has also featured on the website of Very Edible Gardens here in Melbourne. 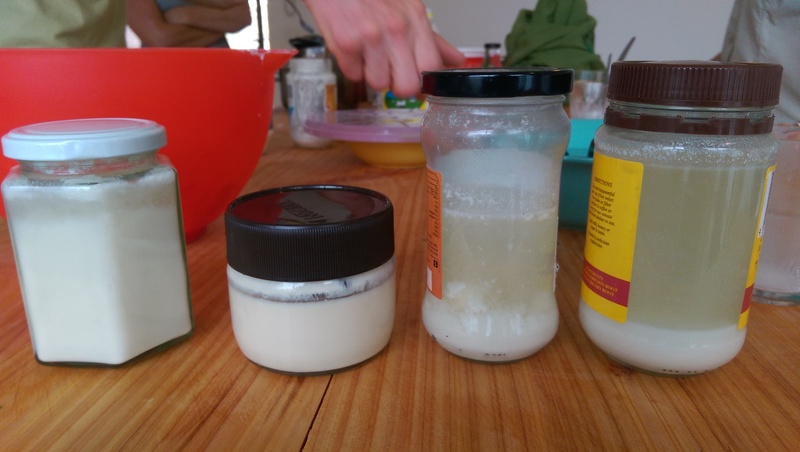 In the second part of the VEG fermentation workshop we moved on to looking at yoghurt and kefir, and learnt how to make yoghurt using a thermos flask, some milk and a small amount of live yoghurt as a starter culture to inoculate the milk with the right bacteria. 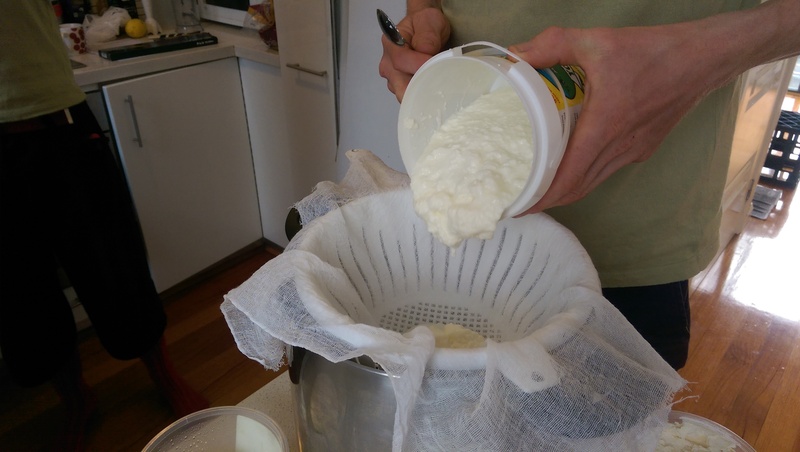 Carey also showed us some cheese that he had made from the homemade yoghurt, simply from straining the yoghurt through some cheesecloth to drain off the whey and leave the curds behind to form a soft cheese. This is known as Labne, and is common in Lebanese and other middle eastern foods. 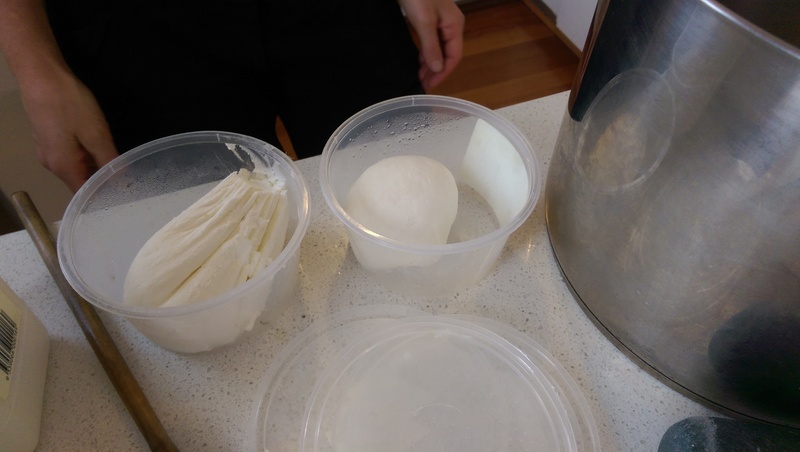 We learnt about how to make kefir, which is similar to yoghurt but contains a much broader mix of bacterial strains – in the same way sourdough bread contains different types and amounts of yeasts and bacteria compared to bread made with commercial yeast that is a specialised strain. Kefir is less stringent that yoghurt on temperature and conditions, it can be made at room temperature whereas yoghurt needs to be a bit warmer at about 40 degrees C.
dairy milk, soy milk, rice milk and coconut milk (from left to right in the photo – hard to tell as once mixed they all looked similar!). They were all quite different to taste, especially as I don’t normally drink dairy milk so to me it tasted quite sour (but not unpleasant). The coconut kefir and rice milk kefirs were pretty good, they had a hint of sweetness along with the sour, fermented flavour, which I thought was a nice mix. The soy kefir was good, but much stronger tasting than I was expecting from drinking soy milk every day! It was more similar to the dairy one than I thought it would be, which was interesting. 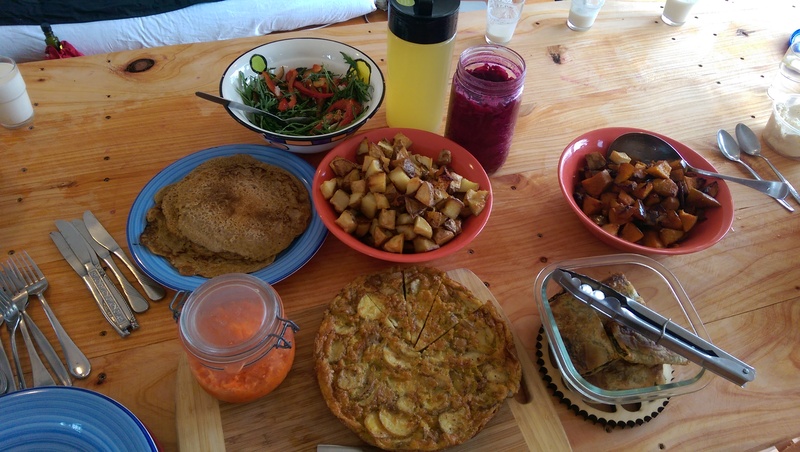 We had a delicious lunch featuring some homemade ferments in the form of carrot and ginger, saurkraut and kimchi, along with sourdough pancakes and some goodies that we’d each taken along to share. I took a Spanish omelette made from our own potatoes and eggs from our girls, it felt great to be able to share some of the things we’ve grown ourselves at home, and to share in the goodies that others had brought, including things they’d grown themselves such as delicious rocket salad. Yum! We washed it down with a lovely sweet lemony drink made from the whey drained from the labne, what a great ‘whey’ to use up the leftovers! Lunch was officially the end of the class, but Cassie suggested we might like to hang around for some homemade yoghurt ice cream that she was whipping up in the ice cream maker. I suppose we could stay for a little while longer… anything for ice cream! Whilst the ice cream maker was doing its thing, Carey showed us his Kombucha drink – a fermented tea drink that also contains a SCOBY. The SCOBY here forms a disc on the top of the drink – check it out of the photo below. We tried a little, it was pretty good – slightly fizzy and I found it quite refreshing. I think I’ll be adding that to my list of things to try! After squeezing in a small bowl of delicious mango and coconut yoghurt icecream we all headed off, armed with our jars of vegetables ready to ferment, our printed booklet of recipes and notes for things to try at home, and full bellies from trying all those different foods! Overall the class was great, we covered a lot of ground and at times moved quite quickly, but I think the balance was pretty good between covering some things in more detail (like how to actually set up the kimchi/saurkraut ferments and how to make yohurt) whilst still introducing the possibilities of other fermented options too, to give a glimpse of other things we might like to try. The atmosphere was great and Carey and Cassie were really helpful in answering all of our questions and sharing their knowledge. Although these things are easy to find on the internet or in books, sometimes it’s just nicer to actually learn from a real life person and interact face to face! Check out my next post to find out what happened next in the fermentation adventure….when we try out our new found fermenting skills at home unsupervised! 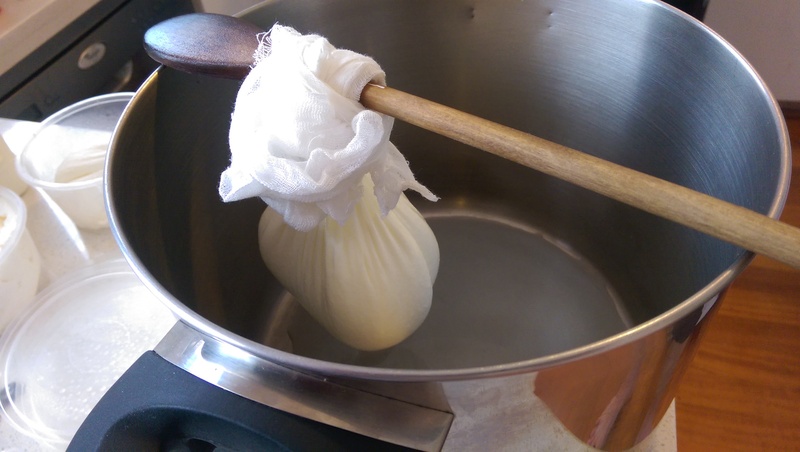 This entry was posted in fermentation, in the kitchen and tagged blogging 101, cooking, fermentation, sustainable living, workshop. Bookmark the permalink.